This piece was done on one of Gannett's local publishing sites. The goal was to show that the local instance could house advertising solutions that are just as glamorous as those found on the national USA/Today site. The interactive advertisement guides viewers through the art gallery's top exhibitions by featuring one piece of art from each exhibition. A click on one of the discovery icons reveals intriguing facts about particular sections of each featured piece. 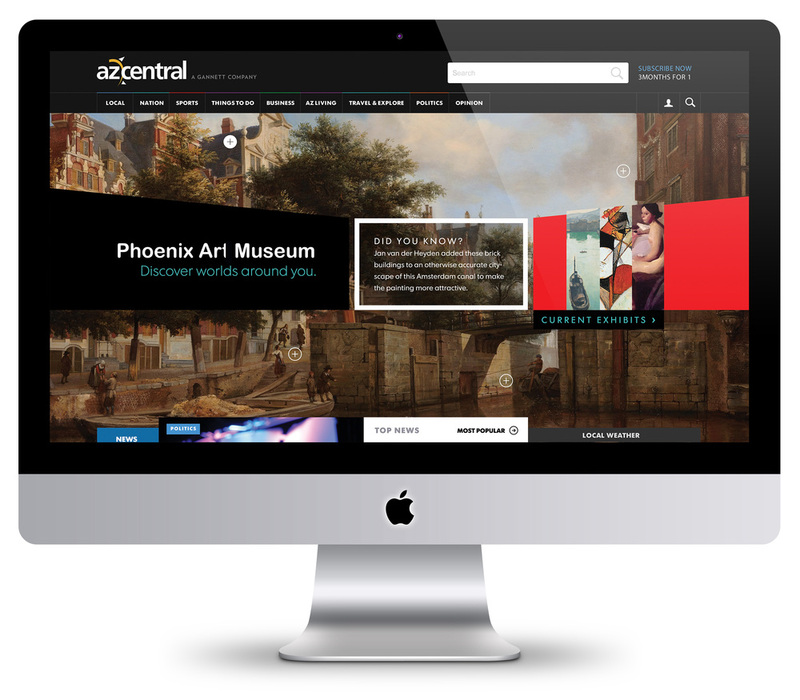 The vision for the ad was to draw users into the world of art—particularly for those users who would not usually be interested in the arts. I was responsible for the concept, design, layout, and functionality of the ad. This ad focuses on the idea that during the holidays, people often buy fashion products with specific moments in mind. You're not just buying a dress, you're buying a dress for "Janey's New Year's Bash." Hovering over each product produces a rollover containing more information about the product and a link to the Macy's website. Pinterest icons are also included with each piece to encourage users to personalize the products for themselves. I was responsible for the concept, campaign copy, design, layout, and functionality of the ad. 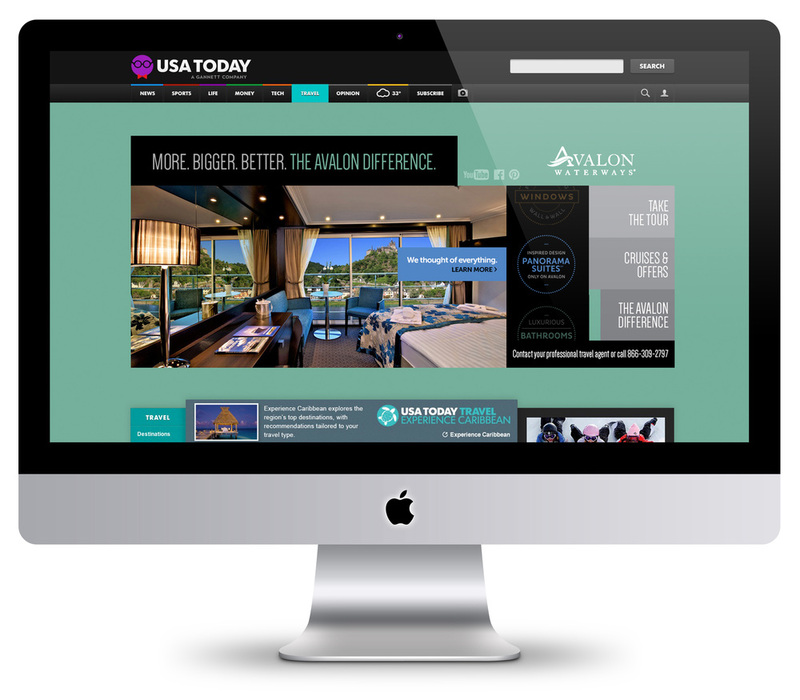 Avalon Waterways was in need of a fairly complicated interactive ad—essentially a website within an ad space. Navigation links in the ad bring users to sections highlighting different aspects of the product. One section contains a "Price-Is-Rightesque" scrolling wheel of icons that features different perks of an Avalon cruise. I was responsible for design, layout, and functionality of the ad. This ad was created to feature Chick-fil-A's new breakfast menu by navigating users through a "Breakfast Personality" quiz. A series of questions like "A kitten is stuck in a tree, you..." helps link the personality of the user to a specific breakfast item. "Congratulations, you're a Cinnomin Swirlser, sweet and gooey." This piece was created to put a spin—literally—on traditional gift guide ads. A menu titled "gifts for your..." allows users to pick which type of relation they would like to shop for. A click on "bestfriend" reveals a curated group of products perfect for your bestfriend. Clicking on any particular product sends users to the Target website. I was responsible for the concept, campaign copy, snowflake-target-logo-integration, design, layout, and functionality of the ad. Book cover design combines two of my favorite things—strong typography and compelling visuals. Both components of a cover are equally important and mutually dependent on each other—painting an enticing morsel of the story to the audience. I love picturing the typographical possibilities of a title when I receive a new book cover assignment. "These words will stack perfectly, blend seamlessly, intertwine awkwardly." Book titles are little typographical puzzles to experiment with, fully investigate, and solve. I have had the privilege of working as a book cover and book interior designer in the publishing industry for over eight years, collaborating with both small and large companies; Amazon Publishing, Girl Friday Productions, becker&mayer!, and Avalon Books, to mention a few of them. My responsibilities include layout design, and content pours for book interiors, and using acute typography, layout design, and detailed Photoshop work to execute creative concepts for book covers. 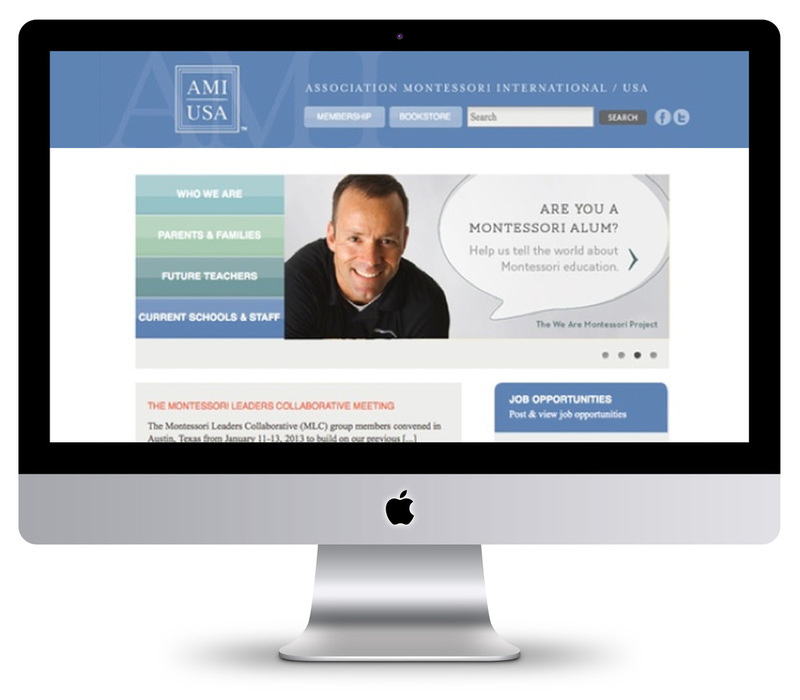 The Association Montessori International is a international non-profit organization that serves to promote the values of Maria Montessori throughout the world. I worked from the ground up to design AMI/USA's previously incongruous and out of date materials. This was achieved by implementing a simple visual brand that is straightforward with great impact – much like the organization. I took the existing logo and integrated it with a solid blue background, a simple watermark, and some sophisticated fonts to make AMI/USA look clean and modern. 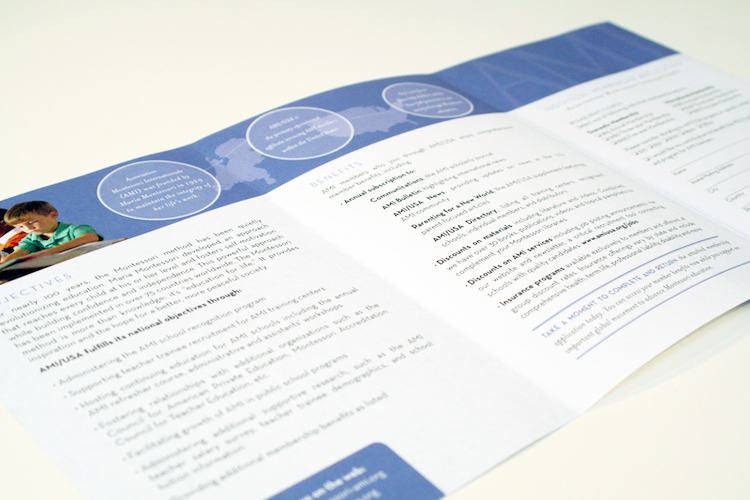 I was responsible for updating all of the organization's promotional materials, including a membership brochure. Lastly, I designed a new user-friendly website to reflect the new brand. This piece was also created for the Association Montessori International. A dedicated team made up of a project manager, a videographer, the executive director of our organization, and myself as the creative director, developed an online resource for Montessori teachers. I was responsible for creating the logo, the project brand, developing a plan to display the resource (a website with Vimeo videos) directing the promo video, and creating the final website. Loudoun Lyric Opera is a grass-roots opera company in Northern Virginia. I was responsible for designing a new logo, branding copy, print materials, and website with the vision of attracting new customers. I modernized the logo by using clean, sans serif fonts on top of a bright banner of color. I was also responsible for creating a brand for the 2015-2016 season. 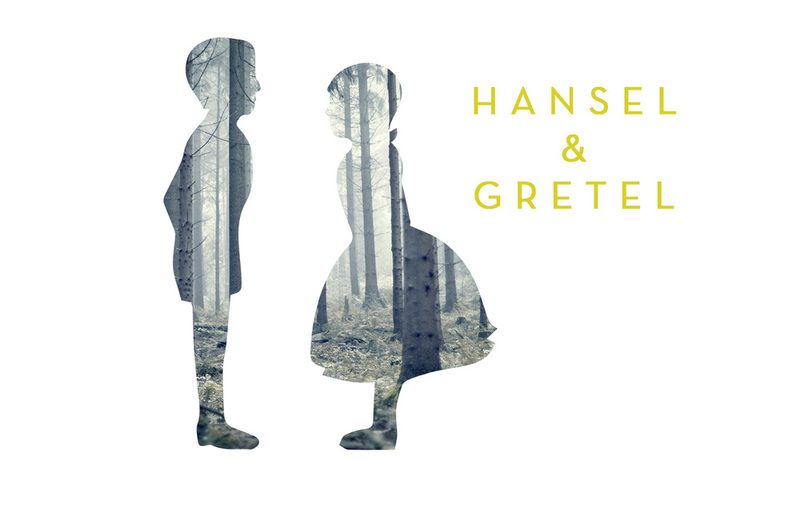 Character silhouettes feature cut outs of opera-specific images; the city of Seville for the "Barber of Seville" and a forest for "Hansel and Gretel."